This is the third WordPress theme released here on I Heart PC, and it’s called Minion. It has 3 columns, and 3 colors (black, white and red links). The content area is 400 pixels wide. As it’s the case with themes released previously on this blog, this one is also under GPL license. 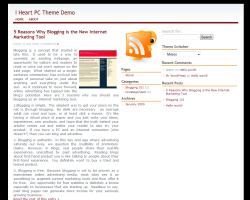 I,m find this theme from wordpress.org. Simple theme, this is for my respons for this theme.Minion theme has high ctr for adsense, I want to used this minion for my health site.Thanks for sharring. nice and simple theme, thanks for free.